Commemorative Swiss stamps of 1954 to 1959 highlight a number of important special events. During this period, the Swiss Post began the practice of issuing all the commemorative stamps for a particular year at one time, usually in the Spring. For stamp collectors, this practice makes Swiss commemorative stamps very easy to manage and organize. The commemorative Swiss stamps shown above were all issued on March 15, 1954. The 10 C. denomination stamp shown above (Zu. #316, Mi. #593, Sc. #347) was issued to publicize the Swiss Agriculture, Forestry, and Horticulture Exhibition, held in Lucerne during September. The 20 C. denomination stamp shown above (Zu. #317, Mi. #594, Sc. #348) was issued to publicize the Swiss Gastronomy Exhibition, held in Bern during May and June. The 25 C. denomination stamp shown above (Zu. #318, Mi. #595, Sc. #349) was issued to celebrate the 50th Anniversary of Swiss Rhine River Navigation, beginning in 1904. The 40 C. denomination stamp shown above (Zu. #319, Mi. #596, Sc. 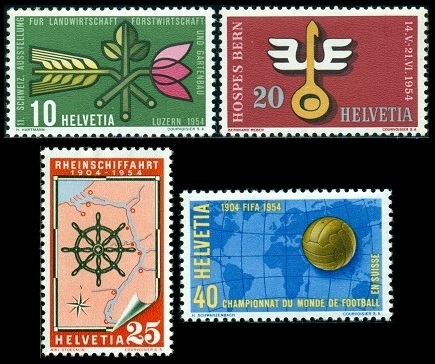 #350) was issued to celebrate the 1954 World Cup Soccer Championships, held in Switzerland from June 16 to July 4, 1954. 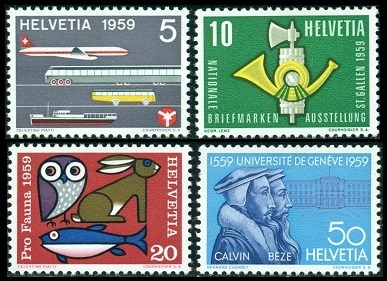 The commemorative Swiss stamps shown above were all issued on February 15, 1955. The 5 C. denomination stamp shown above (Zu. #320, Mi. #607, Sc. #351) was issued to publicize the National Philatelic Exhibition, held in Lausanne. The stamp pictures Lausanne Cathedral and a Post Horn. The 10 C. denomination stamp shown above (Zu. #321, Mi. #608, Sc. #352) was issued to publicize the Vintners Festival, held in Vevey, Canton of Vaud. The stamp pictures a costume hat of Vaud. The 20 C. denomination stamp shown above (Zu. #322, Mi. #609, Sc. #353) was issued to publicize the Alpine Herdsman and Costume Festival, held in Interlaken, Canton of Bern. The stamp pictures a 19th Century Alp Horn blower. The 40 C. denomination stamp shown above (Zu. #323, Mi. #610, Sc. #354) was issued to publicize the 25th International Automobile Show, held in Geneva. The stamp pictures an automobile steering wheel. The souvenir sheet shown above (Zu. #35, Mi. Block 15, Sc. 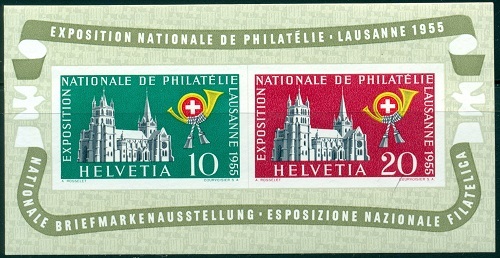 #352a) was issued for the National Philatelic Exhibition, held in Lausanne. The 10 C. and 20 C. denomination Swiss stamps in the souvenir sheet are identical to the 05 C. denomination commemorative stamp. The souvenir sheets measure 103 x 52 mm., and they sold for 2 Francs at the exhibition. 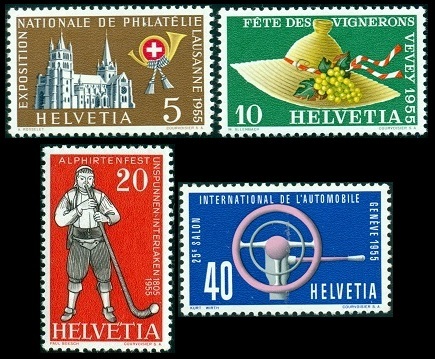 The commemorative Swiss stamps shown above were all issued on March 1, 1956. The 5 C. denomination stamp shown above (Zu. #324, Mi. #623, Sc. #355) was issued to commemorate the 50th Anniversary of the Swiss Postal Bus Service. The 10 C. denomination stamp shown above (Zu. #325, Mi. #624, Sc. #356) was issued to commemorate the 50th Anniversary of the Simplon Tunnel, a railroad tunnel, through the Alps, connecting Brig, Switzerland with Domodossola, Italy. The stamp pictures a train exiting the North Gate of the tunnel and Stockalper Palace. The 20 C. denomination stamp shown above (Zu. #326, Mi. #625, Sc. #357) was issued to publicize Accident Prevention. The stamp pictures school children crossing a street and road signs. The 40 C. denomination stamp shown above (Zu. #327, Mi. #626, Sc. #358) was issued to celebrate the 25th Anniversary of Swissair, the national airline of Switzerland. The commemorative Swiss stamps shown above were all issued on February 27, 1957. The 5 C. denomination stamp shown above (Zu. #328, Mi. #637, Sc. #359) was issued to publicize the International Graphic Arts Exhibition, held in Lausanne. The stamp features an inking device and a printing machine. The 10 C. denomination stamp shown above (Zu. #329a, #329b, Mi. #638, Sc. #360, #360a) was issued to commemorate the 75th Anniversary of the St. Gotthard Railroad. The stamp pictures a train on the Southern end of the St. Gotthard Railroad. Type I - The line at the base of the train is black. Type II - The line at the base of the train is brown. The 20 C. denomination stamp shown above (Zu. #330, Mi. #639, Sc. #361) was issued to publicize Civil Defense. The stamp pictures shields with inscriptions and with the national Coat of Arms. The 40 C. denomination stamp shown above (Zu. #331, Mi. #640, Sc. #362) was issued to commemorate the 2,000th Anniversary of the Founding of Basel. The stamp pictures Munatius Plancus and a view of Basel. Lucius Munatius Plancus (87 BC - 15 BC) was a Roman senator, consul, and censor. 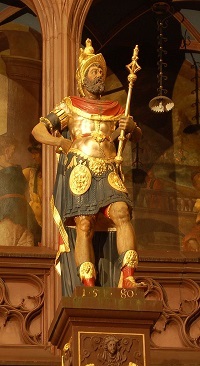 He was an officer in the army of Julius Caesar (100 BC - 44 BC) during the conquest of Gaul. His funerary inscription attests that he founded the city of Augusta Raurica, present-day Basel, in 44 BC. 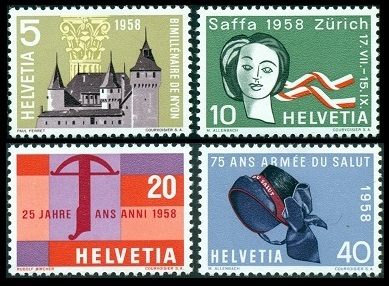 The commemorative Swiss stamps shown above were all issued on March 5, 1958. The 5 C. denomination stamp shown above (Zu. #334, Mi. #653, Sc. #365) was issued to commemorate the 2,000th Anniversary of Nyon in the Canton of Vaud. The stamp pictures the 13th Century Castle of Nyon. The town of Colonia Iulia Equestris or Colonia Equestris Noiodunum, present-day Nyon, was founded by the Romans between 50 BC and 44 BC, and it grew to be a very important Roman frontier city, with its own forum, basilica, and amphitheater. The 10 C. denomination stamp shown above (Zu. #335, Mi. #654, Sc. #366) was issued to publicize the Saffa Exhibition (Swiss Exhibition for Woman's Work), held in Zurich from July through September. The stamp pictures a woman and a ribbon with Swiss colors. The 20 C. denomination stamp shown above (Zu. #336, Mi. #655, Sc. #367) was issued to celebrate the Swiss Manufacturing Industry. The stamp pictures the crossbow trademark. The 40 C. denomination stamp shown above (Zu. #337, Mi. #656, Sc. #368) was issued to commemorate the 75th Anniversary of the Salvation Army in Switzerland. The stamp pictures a Salvation Army hat. 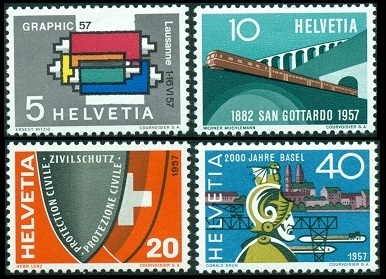 The commemorative Swiss stamps shown above were all issued on March 9, 1959. The 5 C. denomination stamp shown above (Zu. #343, Mi. #668, Sc. #370) was issued to publicize the Opening of the Swiss House of Transport and Communications in Lucerne. 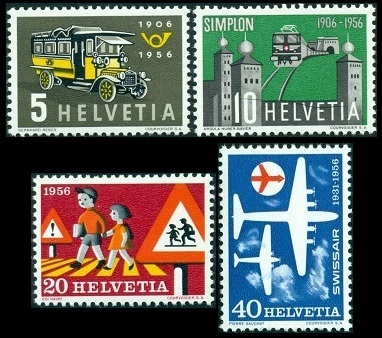 The stamp pictures modes of Swiss transportation. The 10 C. denomination stamp shown above (Zu. #344, Mi. #669, Sc. #371) was issued to publicize the National Philatelic Exhibition, held in St. Gallen. The stamp pictures fasces and a Post Horn. The 20 C. denomination stamp shown above (Zu. #345, Mi. #670, Sc. #372) was issued to publicize Wildlife Protection. The 50 C. denomination stamp shown above (Zu. #346, Mi. #671, Sc. #373) was issued to commemorate the 400th Anniversary of the University of Geneva. The stamp pictures Jean Calvin (1509-1564), the founder of the university, and Theodore de Bèze (1519-1605), the first rector of the university. The souvenir sheet shown above (Zu. WIII #38, Mi. Block 16, Sc. 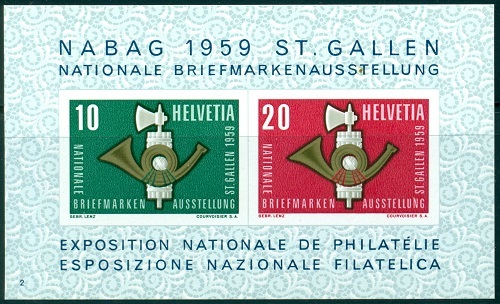 #371a) was issued for the National Philatelic Exhibition, held in St. Gallen. The 10 C. and 20 C. denomination stamps in the souvenir sheet are identical to the 10 C. denomination commemorative stamp. The souvenir sheets measure 94 x 57 mm., and they sold for 2 Francs at the exhibition. The proceeds from the sale of the souvenir sheets benefited the philatelic exhibition. 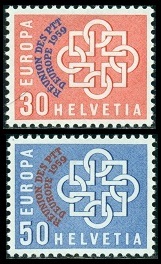 The two EUROPA stamps shown above (Zu. #332-33, Mi. #646-47, Sc. #363-64) were issued on July 15, 1957 to Emphasize European Unity. The 40 C. denomination stamp shown above (Zu. #338, Mi. #662, Sc. #369) was issued on August 25, 1958 for the United Nations Atomic Conference, held in Geneva. 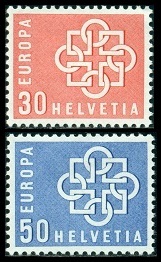 The two EUROPA stamps shown above (Zu. #347-48, Mi. #679-80, Sc. #374-75) were issued on June 22, 1959 to Emphasize European Unity. 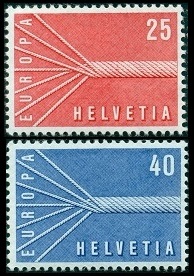 A limited quantity of the 1959 EUROPA stamps were overprinted for the European Conference of Postal Telegraph and Telephone Administrations, held in Montreux from July 22 to July 31, 1959. These stamps (Zu. #349-50, Mi. #681-82, Sc. #376-77) were only sold at a special post office in Montreux during the conference. As a result, they are very scarce today.